It’s time to celebrate Father’s Day 2015 falling on 21st June. India’s first marketplace to buy and sell automobiles, Droom is ready to pick up dad’s day celebrations with an amazing contest. Droom Father’s Day Contest starting today is a great way to win a surprise gift for your daddy. 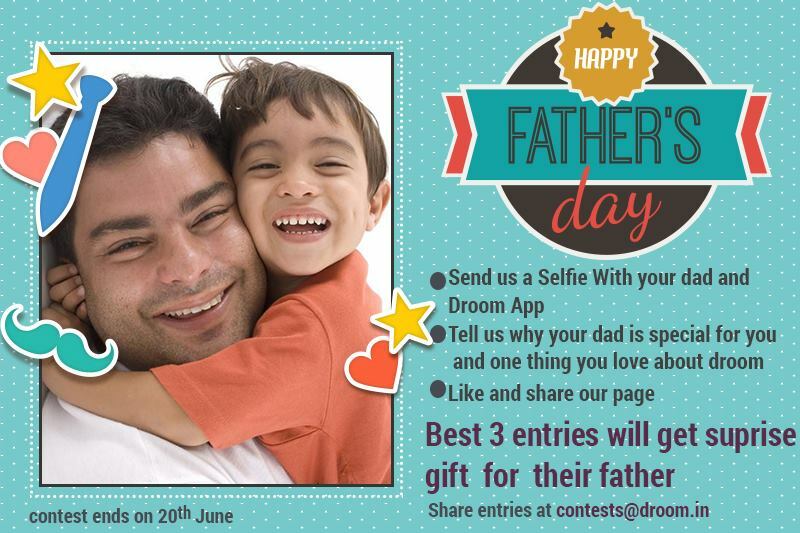 To participate you simply have to click a photograph of your dad and Droom App available for both Android and iOS user along with you and send us at contests@droom.in. Also write us something special about your dad and anything you love about Droom. Also Like and Share our facebook page. We will select the best three entries, who will a wonderful surprise gift for their father. Last date to submit your entries if June 2015. Boy’s superhero and girl’s love, dad is the one who taught us walking, tie shoe laces, and guided through the ups and downs of life. Pamper him on this special occasion with lovely Father’s Day gift from droom.in. Apart from participating in the contest at droom you can find many more outstanding gift ideas for dad, he will surely love. If your dad owns a car, give it a beauty-makeover with car care and detailing packages which are now available with 80% off when you use droom coupon code “CARCARE80”. You can even buy him warranty (80% off with discount code “SECURE80”) or auto inspection (up to 89% off with code). All these offers are valid for limited time. For a more luxury gift, select something from vintage car or vintage motorcycles/scooters categories and make him smile. This Father’s Day make best of all droom coupons to send your dad an exceptional bundle of joys. Hurry up!